Houses vary so much in character and convenience as regards their internal arrangements that one may well be particular before deciding upon one. The house is related to others of its kind in one of three ways. It may be detached, semi-detached, or wholly attached, as one unit in a continuous terrace. It need hardly be pointed out that the two latter forms of relationship have originated in a desire to economise ground space and building materials. They are devices for reducing the original outlay, and the tenant certainly shares in the saving, in the matter of rent, in part, if not altogether. Beyond this it cannot be said that there is any advantage to the tenant in having his house united to someone else's. The disadvantages of the arrangement have already been pointed out. The detached house obviously is so much more desirable that the house-hunter will always find it worth while to pay a slightly higher rent for it. In country districts one has little difficulty in finding detached houses at small and moderate rentals, and usually there is little inducement to pass them by in favour of one of the other types. In towns and suburban districts the difficulty is greater. Land has a considerably higher value, and, in consequence, frontages are restricted to a minimum. Hence the scarcity of detached houses at low rentals. 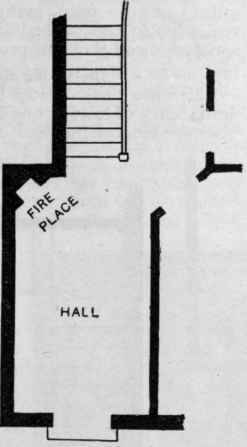 For the same reason the builder is tempted to make up for limited ground space by giving greater height to the house; thus we find houses of several floors in which an apparently endless stairway winds skywards without regard to the labour imposed upon the members of the household in climbing it. Houses of this type put much additional work on the servants and others responsible for their cleanliness and good order, and in many cases an extra servant is needed to cope with this additional work. The sum paid for her wages and board would be better applied in paying the increased rental of a house of fewer floors. The ideal modern villa has all its principal accommodation on two floors, or, if it extends beyond, it is merely to utilise the roof-space for box-rooms, or possibly for the servants' quarters. The relief one experiences in taking up one's residence in a house of this kind after having lived in a three or four storey house must be experienced to be appreciated. 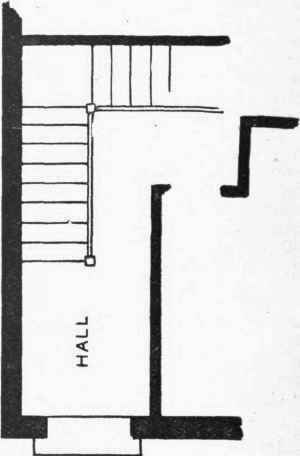 Apart from the very welcome curtailment of "stair exercise," there is a sense of unity and comfort in having all the principal rooms grouped together on two floors; in fact, it may be laid down as a general principle that the comfort and convenience of a house is in the inverse ratio to the length of its stair-carpeting. We may now consider the interior of the house in more detail; but before we step inside we will glance at the porch. A well-designed porch is a desirable addition to any house regarded solely from the point of view of appearances. It is also a very real convenience. In wet and windy weather, particularly at night, its shelter is welcome to the one who waits on the doorstep. There is no excuse for bundling indoors with a dripping umbrella and mud -stained boots. When "speeding the parting guest" the porch stands between the hostess and neuralgia or one or other of the worse ills that lurk in our easterly winds. If facing south it serves another useful purpose in protecting the paintwork of the front door from blistering and premature shabbiness. Not so effective for shelter as the porch, but preferable to no shelter whatever, is the canopy shown in the illustration, a device which has also much to recommend it on the score of appearance. Initial impressions go for much. In entering a house for the first time one generally sums up the household on the strength of a hasty survey of the hall. Narrow halls, which hardly deserve the name, are dark, comfortless, draughty, and inconvenient in many ways. They do not lend themselves to decorative treatment. Strive as they will, they have to admit that, after all, they are nothing but ordinary passages. 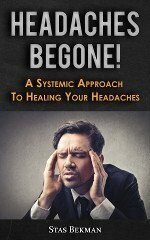 There is no space for those conveniences one expects to find on entering the house, and any attempt to remedy the omission produces a state of congestion inconvenient to the inmates and repellent to the visitor. These attenuated halls have had their day, and, except only in the cheapest property, have given way to more spacious entrances. The up-to-date suburban villa at a modest rental of 35 has a hall five feet in width, which is the very least width consistent with comfort. When the width of the hall exceeds that of the front door by two feet or so, the usual practice is to light it by windows on one or both sides of the door, an arrangement infinitely preferable to the now discredited fanlight. In halls of ample width a fireplace or stove becomes possible, either of which is a convenience that adds immensely to the comfort of the household in winter. Not only does the hall stove strike a note of homeliness and welcome, but its warmth ascends the stairway, diffusing a genial temperature throughout those spaces external to the rooms, which usually are so cold by contrast with the rooms themselves. Intimately related to the hall is the staircase. Staircases vary greatly in design and detail. Perhaps the most objectionable kind is that which faces one directly on entering the front door, starting from a sufficiently wide hall, but usurping space that had better have been thrown into the latter. 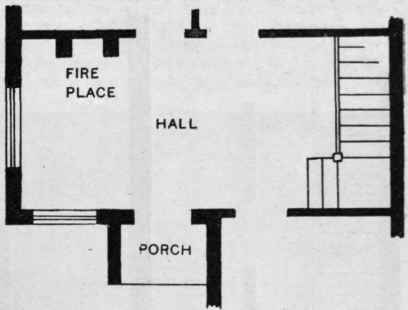 Two arrangements of hall with fireplace (a) Ordinary type for semi-detached villa (b) "Sitting Hall," a better type be made to form a charming introduction to the rooms beyond. There is only one excuse for such an arrangement. It gives a straight course to the stairs, and that permits of fitting the carpeting without the need for turning in, a clumsy and wasteful expedient that cannot be avoided on stairs which are angled. Apart from this difficulty with the carpeting, angled stairs are not altogether free from danger to the incautious. A well-designed staircase should have a square expansion at each turn. The rise of each step should not exceed 61/2 inches, and the width of tread should not be less than 11 inches. This gives an easy angle of ascent with ample foothold. Stairs which rise at a steeper angle are fatiguing and dangerous to those descending them. The minimum width of the staircase consistent with convenience is 3 feet. Ample space should be provided at the stair-head. Stairs which end three feet from a blank wall or bedroom door may provide awkward happenings to strangers. A good roomy landing has much to recommend it. It is useful in case of sickness to be able to put a small table outside the bedroom to accommodate trays, etc., and this is often impossible where space is cramped. On the other hand, too much space external to the rooms makes the house cold, and long passages mean draughtiness. 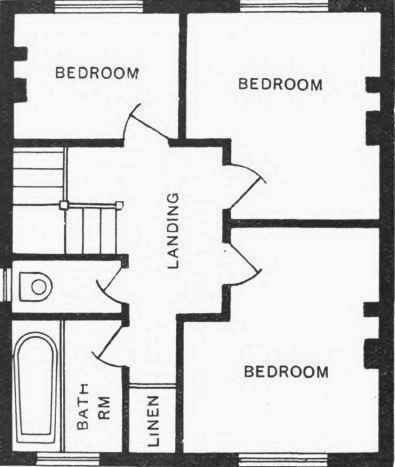 In well-planned villas one finds the principal bedrooms opening on a roomy area more or less square in shape, from which a single short passage leads to the servants' rooms or to a supplementary bedroom. It is remarkable how much the comfort of a house is affected by these apparently unimportant matters. The novice is apt to concentrate his scrutiny upon the rooms, and to overlook questions of access, general convenience, and hygiene, which are largely determined by the spaces external to them. Opinions differ as to the best position for the bathroom, relative to the bedroom accommodation. Perhaps the most convenient arrangement is that it should be readily accessible to all the bedrooms. Not infrequently the bathroom is planned as an annexe to the principal bedroom, from which it opens, a second door being provided for the use of the occupants of the other bedrooms. This is not an ideal arrangement, though certainly a special convenience to those placed in direct communication with the bath. Much, however, depends upon the constitution and habits of the household, and the searcher for the ideal house will be guided by his own special set of circumstances, and give just as much importance to the matter as it deserves. On sanitary, as well as aesthetic, grounds, it is better that the bathroom should not include conveniences other than the bath, except a lavatory basin, which is almost indispensable. A linen cupboard, when present, is usually associated with the bathroom, so as to tap the hot-water system. 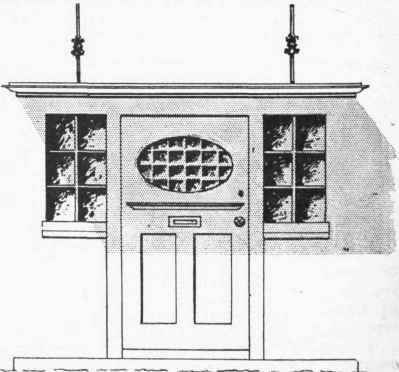 A heated cupboard, with rack shelves, is provided in most modern villas, and is only mentioned here as a reminder to the house-hunter that he may satisfy himself that it is present. Norman Shaw, years ago, when planning the first of our garden suburbs, Bedford Park, took care that the very smallest house had one roomy parlour, and to this day these charming little villas remain as models of all that is best in house-planning on a small scale. Much depends upon the habits of the household as to which of the two sitting-rooms will be used for meals. Usually the positions of the two rooms in relation to the kitchen are such as to involve no difficulties, whichever be chosen. Yet, if it appears that the whole length of a long, narrow hall has to be traversed before the dining-room is reached, it may be preferable to change about, and adopt for meals that room which is situated more conveniently to the kitchen. Dishes have a way of cooling rapidly when carried through a draughty passage, and all long, narrow passages are draughty.